In the process of photographing the meteorite from all angles, I noticed a strange weathering pattern, which clearly distinguished it from all other finds we had made so far. The fusion crust was preserved in patches. This patchwork pattern was either an effect of selective abrasion or the meteorite had already arrived with an incomplete coating of crust. Between those patches of fine textured crust the dark grey and quite coarse grained matrix material was visible. It was showing not the slightest hint of a chondrule. The grains of the matrix were arranged in interlocking and overlapping layers, much like the planking of a Viking longboat. After the documentation was completed I had the pleasure to lift the stone from the ground. It was as hot as an egg pulled from a boiling kettle and I had to flip it from hand to hand to avoid burns. The meteorite had been almost completely exposed with merely 10 percent of its mass embedded in the ground. Our hopes that we had found a new achondrite were dwindling as our magnet flipped heavily onto the rock. Probably an H-type chondrite was the other’s opinion. It still did not convince me. The surface texture reminded me on the ureilites Shisr 007 and Dar al Gani 999. Later back home, after several hours of pointless cutting and after two wasted diamond saw blades, the fact that we indeed had stumbled upon an ureilite finally seeped in. In fact the classification result would later confirm the rock as a polymict ureilite. Ureilites are named after the type specimen which fell after a spectacular daytime fireball and loud detonations near the village of Novo-Urei, Russia, on the morning of September 4, 1886. It is widely reported that several fragments of the meteorite were eaten by the finders who believed to attain supernatural powers. Ureilites are ultramafic achondrites primarily composed of olivine and pyroxene with high amounts of intergranular fine grained metal, sulfides, and silicates. They contain significant amounts both of amorphous carbon and its coexisting phases, such as graphite, organic carbon, carbides, cohenite, diamond and lonsdaleite. The presence of diamond in ureilites has been correlated with the high degree of shock metamorphism of the ureilite’s parent body due to one or several catastrophic impact events. The genesis of ureilites remains yet to be fully understood and no definite parent body for these intriguing achondrites has been determined yet. Current consensus is that ureilites originate from a C-type asteroid. Up to July 2009 the Meteoritical Bulletin lists only 226 known ureilites. Unfortunately, chances for additional finds in the area were about zero. Both our teams searched for the best part of three hours, but with one or two pieces of black chert per ten square meters it was like searching the literal needle in the haystack. 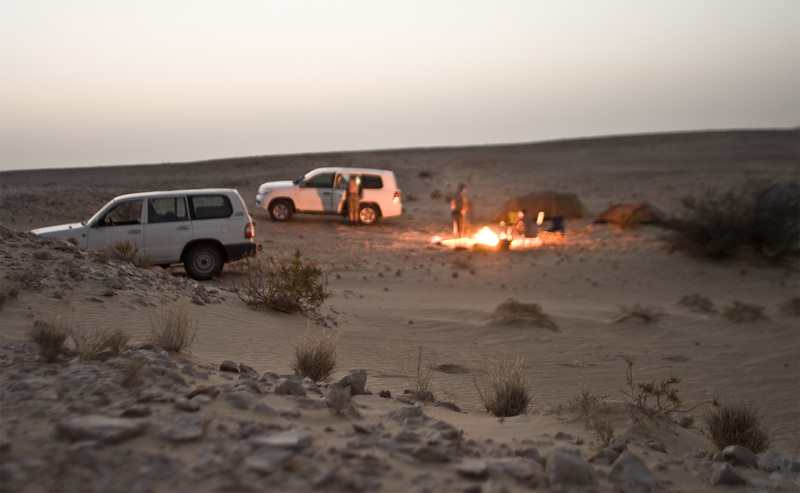 With the setting sun we had to continue, as we had not yet scouted a camp site for the night and there was no suitable place in sight for miles. We found a group of shallow hills, and Thomas and I set up our camping chairs to enjoy a premium view of what promised to be a classy sunset. We were surprised that our Russian friends only stopped by for a brief cup of tea. Pjotr was by no means satisfied with the day’s success and he was hell bent to continue searching until dark, much to the regret of Ivan, who’s hopes for some much needed camp fire recreation faded. However there was nothing else for him to it but to grin and bear it. And off they went again. Cooling down at 104°F. No tumblers, no ice. It was the desert’s most beautiful hour. Still too hot to feel comfortable, but you could at least expose some skin without risking immediate burns. The wind had died and a silence lasted over the vast empty land that was almost palpable. Thomas and I went for a little stroll across the red baked plain. On several spots bone dry roots told of an intermezzo, during which the ground had once and only for a short while supported a few green shrubs. Under our feet the wood completely disintegrated like a puff-ball in a grey cloud of dust. It must have been decades ago that rain last fell here. We returned to the camp to get a drink and to spoon some canned tuna. Every once in a while we heard the engine of Pjotr’s Toyota roaring in some distant deep sand field, ripping through the complete silence of the scenery. When we had finished the starters the others returned. A tiny meteorite fragment of merely five grams had saved their day. Ivan had found it and he was evidently happy accepting our congratulations. When the two had set up their tents Pjotr fired up the unavoidable Tunguska stove to brew up a tea. He was puzzled by a box of Earl Grey which he had purchased in the local supermarket and which was labelled a “Russian speciality”. “What in the world is the Russian feature with this tea” he asked me. “You tell me Pjotr, I am little familiar with the local beverage across the Ural” I replied. “There is no such thing in Russia as this tea” he bristled, “not even close”. Most likely the producers had decided to beef up their dull brand with some exotic claim, and “Russian speciality” probably fit their concept of a unique selling proposition for this kind of tea saturated local market best. We found some other weird products in our supplies, all witness to our more or less aimless shopping in a supermarket clearly outfitted for westerners. In any case I could hardly imagine a local Bedouin buying canned cheddar cheese cake, at least not unless he hadn’t spent too much time in the sun. Who of us bought this bizarre stuff anyway? I strongly suspected Thomas and made a mental note to be on the watch for culinary surprises once it was his turn to cook. I stuck to the fresh supplies which we had subsequently acquired on the local souk and baked us an exquisite omelette with fresh garlic, onions, tomatoes and red pepper. To add a local flavour I made use of a bottle of harissa. The latter is a spicy paste originally from Tunisia, but widespread throughout all North Africa. It is mainly made of dried chillies, anchos, guajillos, garlic, red bell pepper, caraway seed, coriander and olive oil. Harissa requires careful dosage if you do not want to jeopardize your team’s loyalty. Suddenly, much to our surprise, another scarab appeared at the camp fire. Scuttling between our legs he inspected every corner of the camp, but always returned to where we were sitting, as if to look if there would still be someone watching. For a second I had lost sight of the shimmering insect when the accident happened. While I turned around I knocked over a large water bottle that someone had put near my foot. It fell with a thud. Although it was quite unlikely that of all places the precious beetle had just stood where the bottle fell, we all held our breath when I cautiously lifted the hazardous container. “Ouch” said someone, when the motionless insect which the bottle had driven deep into the sand became visible. “In your case I would fear the revenge of the Pharaoh now” Thomas said dryly. “Maybe it’s just taking a nap” Ivan suggested. The dung beetle looked beaten up. Its limbs stuck out in odd angles. My skills in coleoptera reanimation were limited, but something had to be done. So I put the insect in the palm of my hand and started cautiously to pour water on it. Perhaps it had played dead following a defensive reflex or it was in fact knocked out, however, with a sudden shudder, life returned into the scarab. Followed by a cheer of our little party the animal spread its limbs, instantly started running down my arm, onto the sand and continued to patrol the camp. Obviously the animal bore me no grudge as it repeatedly looked for my company. The night was calm except for the steady wind, which was frequently sending gusts of sand through the mesh window of my inner tent. With 102° F lowest at nights, I only used my sleeping bag as a mattress. Although the mesh fabric was a good two feet above the ground clouds of sand kept pouring down on me. 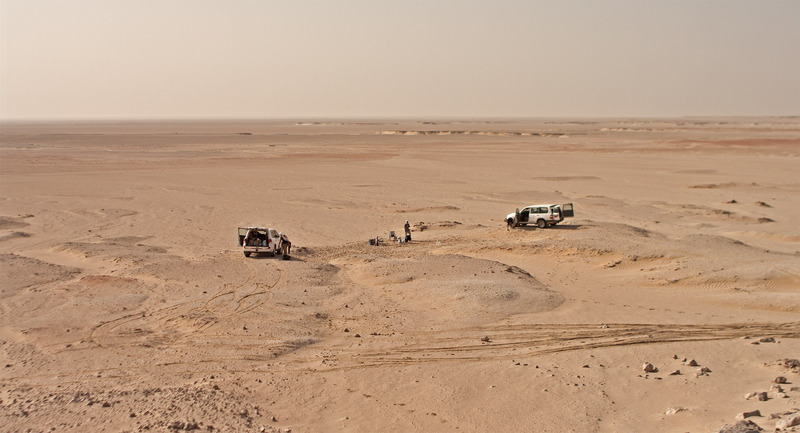 I was convinced those sand movement modellers, claiming that windborne sand moves only close to the ground at normal wind velocities, never spent a single night in a tent out here. I woke up coated with several layers of fine grained dust from head to feet. Between my teeth I could study the effects of sand abrasion. When I crawled out of my tent I looked down at me and figured that I blended perfectly with the desert environment. I felt a bit like William Baker, the Marvel comic character known as “the Sandman”. However I decided to prefer civilized appearance to camouflage and went to take an improvised shower. “Where do you want to go today?” Pjotr asked after we had stowed our gear. “Well I planned yesterday’s course, don’t you want to lead today?” I suggested. “Njet” he replied, “you did well yesterday, perhaps you’re still on a roll” he smiled. “Fine” I said, drawing a mental picture of the area’s geography. On our traverse from the north a couple of days ago we had passed an impressive landmark. 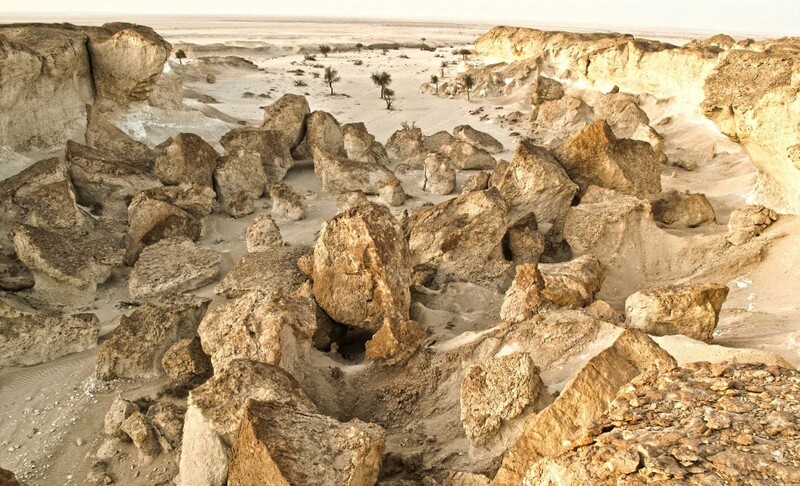 It was a chain of four rock outcrops with the largest resembling a crab with a pair of scissors folded in front of it. It was probably not more than 20 kilometres away and we had not searched the area on our way south. “Northwest it is” I called as Thomas fired up the engine. “Severo-zapad” I heard Pjotr relay to Ivan, who was in charge of his GPS today. I grabbed a fistful of dates and enjoyed the fresh morning breeze as Thomas steered our car over the low bank bordering our campsite. After just a minute or two, we hadn’t even started yet, I recognized a large suspect object coming into sight some eighty yards ahead. “This might already be today’s first customer” I said and Thomas slightly adjusted our course towards the black spot. If it really was a meteorite it appeared to be quite impressive in size. He passed the stone on the driver’s side stopped and leaned out of his window to get a better view. A quiet whistle was his only comment. Impatiently I jumped out, paced around the car and suddenly stood in front a decent kilo sized meteorite, half embedded in the white gravel. Although discoveries like these were the declared purpose of the expedition, and although we anticipated finds every minute while working in the field, now, in the instant of accomplishment, I caught myself completely surprised at the sight. The black meteorite was shaped like a cobble stone, with gently curved flanks which showed a coating of dull black fusion crust. Little sand abrasion had damaged the subtle texture and single flow features were still visible on its leeward sides. One broken surface showed single chondrules sticking out under a thin layer of desert varnish. With its compact but elegant shape, its striking contrast to the surrounding landscape and the tranquillity in which it rested in the ground, the dark rock almost palpably beamed with alienness and sublimity. 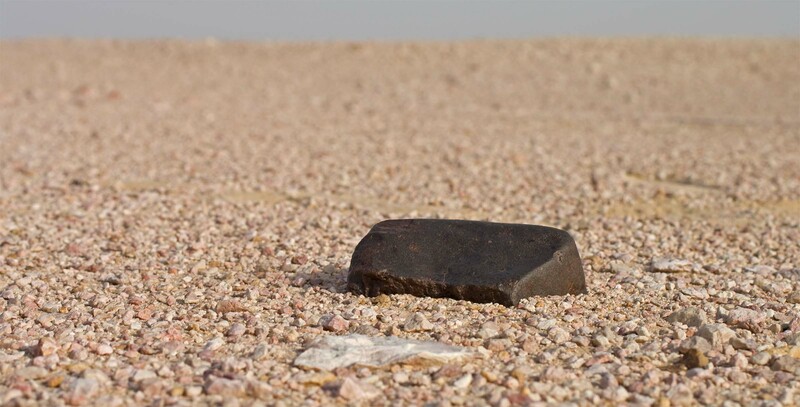 I wondered if a wanderer passing by and who had never heard of meteorites, might not instinctively recognize the extraterrestrial origin of such a strange and solitary erratic.